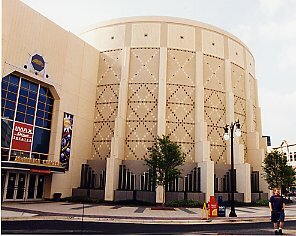 Downtown() The McWane Center in its exhibit focusing on Jones Valley has removed Birmingham from the model depicting area cities. According to McWane scientists, there are five entity types that make up a county. These are: unpeopled lands, peopled lands, industrial parks, corporate lands, and cities. Peopled lands need residents, businesses, schools, and public services before they are considered cities. Apparently Birmingham is missing most of these basics and therefore will no longer be considered a true city. While debate rages amongst McWane scientists as to what to call it, the camp declaring Birmingham a 'citoid' seems to be gaining the upper hand. McWane economist Billy Joe Franklin agrees that Birmingham fails to meet enough criteria to be considered a city. "There are no businesses open after dark and very few residents to patronize them anyway. According to the state, Birmingham doesn't even have enough people to hold its own elections. Attorney General Pryor is just being nice to let them keep pretending." Other McWane scientists cite Birmingham's lack of schools and other basic services as reasons for loss of city status. "We have schools," says councilwoman Pat Alexander, a member of the Education Committee. "Haven't you seen the new Carver High School. They have their own swimming pool." Franklin admits his group may have overlooked the Birmingham school system. "That's an insignificant detail though. There is so much else lacking in the city, from shopping malls to public transportation to residents, that the discovery of a school system does not affect our findings." It seems that Birmingham's new classification as a 'citoid' places it squarely in the corporate lands mix. "The remnants of a city government does exist," says Franklin. "But they answer directly to corporate interests since there are no full time residents left. That is why Alabama Power wants to build a model neighborhood in the Fountain Heights community. They hope to regain city status for Birmingham while still maintaining control." The few hardy residents in the area seem excited by the possibility of a corporate town. "I hope they are going to have a company store," says Jouqilyn Green. "My dollars don't do me any good without a place to shop." Downtown() Absolute devotion to the Bushido code led to the demise of a Birmingham IT worker this week. 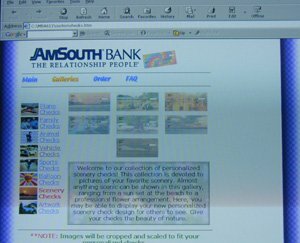 Shawn Hamby collapsed Sunday morning in the computer center at Amsouth bank after working 56 consecutive hours on the bank's new online check ordering system. He was discovered several hours later by security personnel on a routine sweep. After being rushed to the hospital, Hamby was pronounced dead from karoshi, a Japanese condition related to overwork and stressful e-commerce initiatives. Hamby arrived to work at 8:00 AM Friday morning after a four hour rest that allowed him to go home, take a shower, and have some leftover McDonalds before returning to the computer center to continue working. Prior to his collapse, Hamby had worked 26 hours straight on a problem involving the check customization web page. This cool little applet was supposed to let customers see their check designs online before submitting an order. Many clever themes from balloons to Star Trek vessels are available to select from as well as eight plain color schemes. Hamby's karoshi causing conundrum came when trying to match the available check designs to the three different check covers. "He almost succeeded," said Amsouth marketing director Scott Simmons. "What he has is very cool. You can see your checks changing as you click on the different designs. My favorite is the seascapes layout. There is a really cool picture of Cape Cod on one of them." Vestavia() The formula has been tried, tested, tweaked, and finally (city leaders hope) gotten right this time. A new Pizza Hut on Montgomery Highway in Vestavia Hills is set to open next month and will usher in a new era of prosperity for this lagging over the mountain community. Previous attempts at the Pizza Hut model were not entirely successful due to poor planning. The first Pizza Hut renaissance was attempted when the Godfather's chain ceased operations and national superstar Pizza Hut moved into the Vestavia community. While quite profitable at its Columbiana location, the critical mass was not there to bring in many regional visitors. 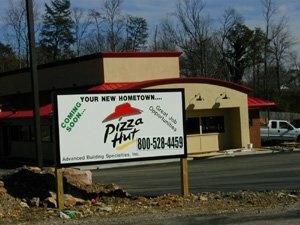 So with encouragement from the city, the Pizza Hut corporation choose to open another restaurant less than half a mile from the Columbiana location. However, this model failed to meet revenue projections due to the limited capacity of the roads in the area. Former mayor Sarah Wuska describes the situation as simply too congested. "The Highway 31 and Columbiana intersection was just not meant to handle that much traffic. What with the huge crowds already generated by having two Waffle Houses across the street from each other." But with the new Pizza Hut situated right next to the Ruby Tuesday, city officials now have the magnet ready to draw in more lucrative shopping and tourist dollars. With visions of The Summit dancing in their heads, city officials have earmarked thousands of dollars to set up an enterprise zone along the highway through downtown Vestavia. The Vestavia Antiques Mall will expand to take over the old Delchamp's (formerly Western) location, and a shuttle will begin operations to transport people and their money from the mega mall to the restaurant district with its Pizza Hut, Red Lobster, and Ruby Tuesday. Local residents are hailing the move as a sign that city officials have finally figured out how to earn revenue from some of the most valuable property in the entire state. "The old leadership went over there and annexed that Liberty Park fiasco, and didn't get one red cent in revenue from it," said new Vestavia mayor Scotty McCallum. "In fact we had to build them a new school and fire station. Oh sure they hoped to get an interchange built so we could build a million acre mall off I-459. But that may never happen. So we have done what the V3 wanted, and come up with a new plan for Vestavia's future." That plan includes the continuing development of the Highway 31 corridor into a shopping Mecca. After the Pizza Hut phase, plans are on the board for a new miniature golf course to be added to the Vestavia Family Fun Center (formerly Vestavia Bowl). "We have only begun to explore the possibilities," said McCallum. "Our people now have a nice place to eat without having to drive miles out of the way. In addition we have made Vestavia an attractive place to visit for the millions of people who drive Highway 31 every year. It's a win-win situation for everyone." No date has been set for the start of development beyond the Pizza Hut.